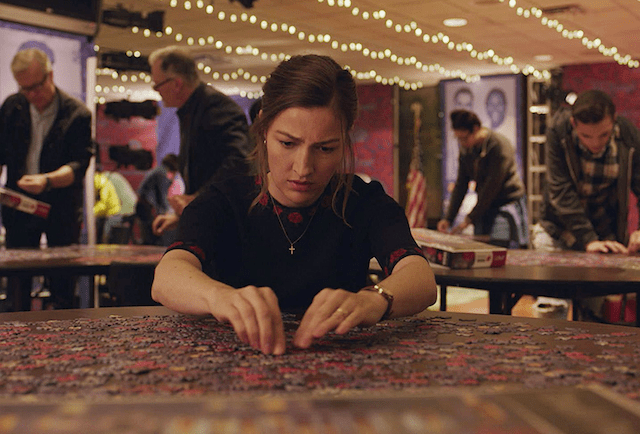 Puzzle, a ‘wonderfully enjoyable and uplifting’ drama, directed by Marc Turtletaub, is set to open the 72nd edition of the Edinburgh International Film Festival. Starring Scottish actress Kelly MacDonald (Trainspotting, Gosford Park) and legendary Bollywood character actor Irrfan Khan (Jurassic World, Maqbool) the film tells the story of housewife Agnes (MacDonald) who rarely ventures far from her home or community. When she receives a puzzle as a birthday gift she discovers an untapped talent and, as she pursues her new hobby, her life begins to change. She meets Robert (Khan) a rich and reclusive inventor and he invites her to be his partner in a worldwide jigsaw tournament. Their journey together opens her eyes to new things and a confidence inside herself that propels her to question the assumptions and routines of her daily life. Kelly Macdonald and Marc Turtletaub will both be in attendance and Turtletaub has described it as being a ‘great honour’ for Puzzle to be opening the festival, which opens on 20 June. Tickets go on sale to Filmhouse members on 23 May and on sale to the public on 25 May.